Expand your business communication capabilities with Internet mail on Lotus Domino for AS/400. Now your mail users can contact and connect with an entire world of people who are eager to communicate with them. 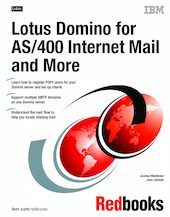 This IBM Redbooks publication explains how to set up your Lotus Domino for AS/400 server to exchange mail with other SMTP servers, including those within the Internet. It explains a broad spectrum of Lotus Domino for AS/400 and SMTP mail topics, such as POP3, IMAP, and MIME. It demonstrates several approaches for registering both Notes and POP3 users, and takes you through the steps to ensure consistent user settings through user setup profiles. Plus, it introduces the new feature that now allows you to bind OS/400 to a specific IP address to support both Domino SMTP and OS/400 SMTP at the same time. This book targets Lotus Domino for AS/400 administrators who configure their organization's servers for Internet mail. If you've been given the task to take your Domino Mail to a new level, this is the book for you.